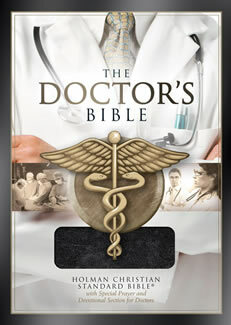 The Doctor’s Bible combines the full text of the popular Holman CSB translation with sixty pages of additional information and inspiration for dentists and physicians. The ancillary material is provided by the Christian Medical and Dental Associations that exist to motivate, educate, and equip Christian doctors to glorify God through their work. This Bible’s portable design and brief specialty entries enable users to step back for just a few minutes to refocus on the important in the midst of the urgent. Devotions include The Mission of a Christian Doctor,” The Practice of Compassion,” A Question of Character,” The Other Side of the Curtain,” Lazarus at Our Gate,” and more. Dr. Al Weir is the Vice President for Campus and Community Ministries. He is board certified in Internal Medicine, with certifications in hematology and oncology. Throughout his career, Dr. Weir has acted in many important leadership roles, including President of the Christian Medical & Dental Associations and an Internal Medicine Consultant for Eku Baptist Hospital in Eku, Nigeria. He is the author of two books: When Your Doctor Has Bad News (Zondervan, 2003) and Practice by the Book (CMDA, 2005). Dr. Weir is a visionary, working with CMDA's Specialty Sections, Side-by-Side, Completing Your Call and 4% Solution.